Cindy became a Certified Canine Massage Therapist in January 2016 after completing the canine massage course at Royal Canadian College of Massage Therapy in Toronto, ON. She has always had a passion for helping & healing animals and this allows her another way to do so but in a natural, holistic manner. Massage has a positive influence on both the physical and psychological well being of dogs of all ages and conditions. 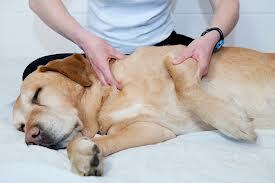 Most dogs tolerate massage therapy very well and enjoy the relaxing benefits after just the first session. *Depending on the condition being treated, multiple sessions may be recommended for full benefits to be achieved. During the initial appointment we will discuss your dogs medical history, complete a detailed patient intake form and complete a gait analysis. Your dog will also get a chance to experience their first massage and become acquainted with how massage therapy feels. We will then discuss findings and recommended follow up, and answer any questions you may have. *In the case of any medical condition, please contact your veterinarian for approval before your first massage therapy appointment. Package of 10 Sessions (1 Hour Each).............$300 *SAVE 15%! Package of 5 Sessions (1 Hour Each).............$160 *SAVE 10%! *Add this massage on to any dog walk or pet sitting visit; initial assessment must be completed prior. Many pet insurance companies offer coverage for massage therapy-please check with your current provider for details.